Are you a JIO service user who want to recharge Jio Dhan Dhana Dhan ?Here are some Cashback offers for Jio Recharge. We will update this as soon as we found any new offers. Amazon Pay offers the best cash back offer, when you recharge your JIO phone using Amazon Pay for the first time (Use Amazon Pay balance) you will get a cash back of INR 99, the minimum recharge amount is Rs. 309. The cash back will be credited to your amazon pay with in 7 Days. Amazon Pay offers 100% cashback on other recharges (up to Rs.50) on other prepaid mobile recharges (Airtel not supported as of now). PhonePe is a UPI based payments app (Android and iOS apps available). This offer cash backs for first three recharges of Reliance Jio. First recharge will give you INR 75, Second Rs.50 and Third Rs. 25 back. This offer can be available once per PhonePe account. The minimum amount to avail the cashback is INR 300. You will not be able to withdrawn the cashback to bank accounts. If you are doing your first recharge you can get Rs. 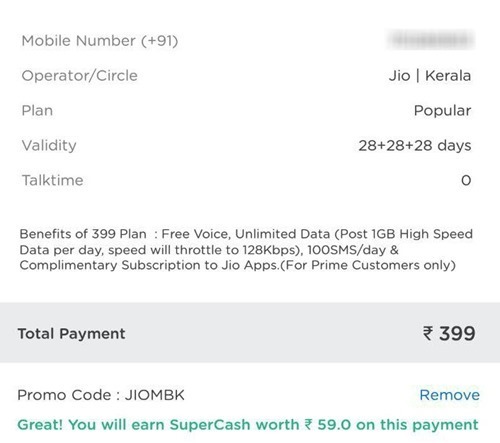 159 cash back (Promo code: NEWJIO), otherwise get INR 59 cashback using the coupon code JIOMBK. Get a cashback up to INR 99 while you recharge your Reliance JIO. Diwali Offer - Get 100% cashback when you recharge JIO.